Once upon a time, farming was, at some level, the source of food and livelihood for each family. That’s not the case now, of course, but somewhere between growing some herbs and tomatoes on your back porch, and “Honey, it’s time to milk the cows and plow the fields!” is a growing contingent of people who are discovering the joy of keeping chickens. Fresh eggs are delicious, and so is the sweetness of these birds. Don’t believe me? I think this video speaks for itself. Chicken-keeping is low maintenance and high reward. With just a little bit of space you can house and care for your little flock and in return you get eggs, fertilizer, natural tick, flea and other pest control and ultimately, if you’re ready to part with them, they also give you meat. What’s not to love, right? But hold your horses...or your hens, in this case. 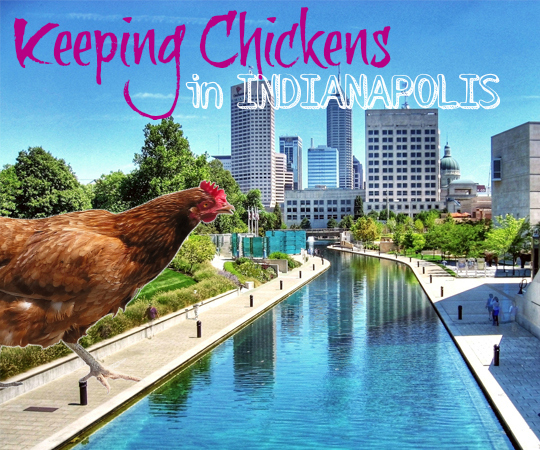 While keeping chickens in Indianapolis both in urban and suburban areas is legal according to city code, you do need to check with your HOA. Their code might be a whole other story. Be aware also that if you’re going to keep roosters, there are almost always noise ordinances to be followed. It’s still quite doable, you’ll just have to make sure your roosters stay in a dark roost until a reasonable hour of the day. This begs the question; do you need a rooster for eggs? No! Hens start laying eggs at six months old, and they’ll keep this up throughout their youth, as long as they’re happy and have plenty of light. The more hours of daylight a hen has, the more eggs they produce. A trick for the winter is to put lights in their coop in the early morning and early evening, to increase the number of daylight hours. Chickens are clean birds, although their idea of bathing is tossing dust over themselves, and they don’t stink if you clean up after them. Reserve a portion of your yard for composting the poop. Bury it under a layer of soil. By next summer, you can use this as fertilizer. On that note, you can’t use fresh chicken manure on your plants. It’s too rich in nitrogen and it will burn your plants. The manure needs to ‘mature’ before you can use it, but once it does, its nitrogen, potassium and phosphorous will turn your flowerbeds into an explosion of blooms. Happy hens are chickens that are funny and sweet. They’re hilarious and friendly. They know who feeds them, and they’re so social they would even boss the dog or your husband. Speaking of being social, it’s not the best idea to try to have only one chicken. You should have at least three chickens—the ideal minimum number is four, and they need a coop to sleep in, and a ‘run’ to scratch around in. This is what makes them happy. Chickens have an innate sense about the time of day and will put themselves to bed promptly at sunset. It will be up to you to make sure their coop is closed up for the evening so no predators can get in. In terms of production, if you keep them happy, chickens can give you an egg daily. They average at five eggs a week, with hens taking only one day-off or two. How long do they lay eggs? Depending on the breed anywhere between two and four years, although as they age the eggs can become fewer and fewer, by which time they become pets, or your dinner. Good food. Keep the food in sealed containers so you don’t attract vermin. Mice and rats are attracted to the feed, and the mice and rats can attract feral cats. Don’t overfeed so that you end up with leftovers. If you give your birds table scraps, make sure they get them all and clean up what remains. A good coop. Well-ventilated without being breezy; always clean to protect your hens’ feet; has a dark cozy place for laying; has a perch for each hen, around two feet off the floor; secure and sturdy against predators. There are about a million variations to how you can house your chickens - a bit of googling will get you every creative solution you could want. Air, soil and sunlight. A bit of yard to roam in. You’re sacrificing turf to free-range eggs! Your run should be fenced in to keep the rest of your backyard or garden undamaged. These birds ransack everything grass and plants looking for snacks, you know. Give chickens a chance, they really are amazing pets and food producers. I highly recommend them!